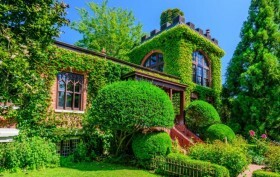 A dome-shaped home located on the Reeves Bay in Flanders, New York has hit the market at an asking price of $729,000. While the 1,762-square-foot pad keeps things compact inside, it sits on nearly an acre of land and includes incredible waterfront views. 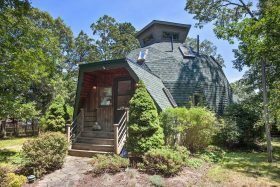 As Curbed Hamptons reported, the Southampton dome at 48 Huntington Lane first sold in 2005 for $728,500 and returned to the market this July for $899,000. 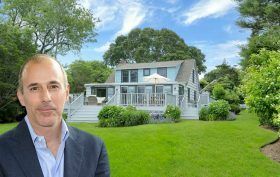 In addition to the artistic design, the three-bedroom, two-bathroom home features docking rights, a garage and air conditioning. You might not think of a starkly modern home as calming or tranquil, but then you’ve probably never seen the Residence in Southampton by Sawyer|Berson architects. Built for designer Kelly Behun and her family, the home is characterized by its dramatic overhangs, large expanses of glass, and flowing, open floor plan. Part of a series of pavilions, the main house, pool, pool house, and guest wing are all oriented south to take advantage of the stunning beach views. The seven-bedroom home boasts a screening room, gym, and an an impressive collection of art. 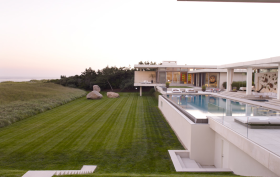 Perhaps the most interesting element of the residence is the infinity pool, which is visible from the gym and yard.